Growing up, before the arrival of Maruti 800 most middle class homes owned a scooter, preferably a Vespa. Lately, I haven’t seen a pure blooded scooter in Gurgaon. Of course, Scooty, the under nourished variant driven by delivery boys and women ferrying kids is common. All too often, it lurches absent mindedly from the wrong side of the road, but is hardly a match for the rotund yet robust Vespa. Or the Lambereta. It’s easy to see why I remember riding dad’s lemon Vespa more than our first brick red Maruti 800. The scooter, apart from being a vehicle that allowed us to zip through crammed by-lanes was perfect for any sulking kid. Much like a swing, the thrill of speed against the wind, followed by an ice cream was liberating - like flying in the air, away from the drudgery of homework and mom’s rules specifically set-up to torture me. As a partner in crime, the scooter threw tantrums when it refused to rev-up on a crisp winter morning around school time. Fingers crossed, one stood hoping to enjoy a holiday. But a tip and few spirited kicks ensured that it was time for morning assembly prayer. While it was low on maintenance and dependable, comfort was alien to scooter rides given the harsh weather conditions. 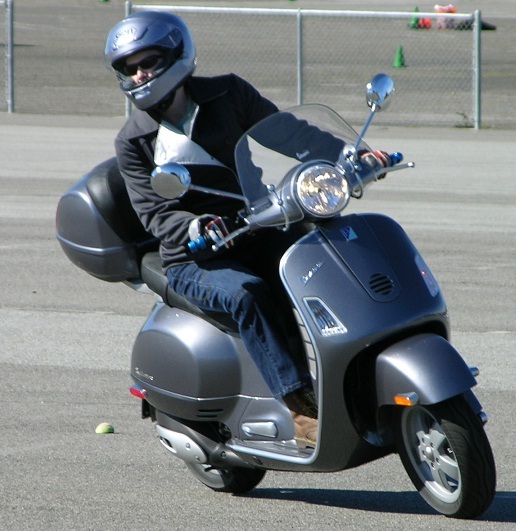 Regardless, many amusing anecdotes ride my scooter memories. As it used to happen, mom would gently whisper ‘chaliye’ once she was securely perched and dad would then drive off. Once however, lost in his thoughts, dad drove off without checking if mother was on the pillion. What added to the embarrassment of being stranded in a market was the shopkeeper’s hollering, ‘Arrey, doctor sahib, madam to yahin reh gayin’. No prizes for guessing that dad got an earful after he realized his folly! Of course, the banter played itself out once both were back home. Unlike a scooter, a bike usually a rickety noisy Enfield, was driven either by the milkman or young men as a symbol of machismo. Brawn. A Bollywood hero, for instance was seldom seen riding a scooter barring a Randhir Kapoor in Jawani Diwani. Perhaps the Kapoors have some karmic connection with scooters, because the last I saw a hero riding a scooter was Ranbir Kapoor in the movie Rocket Singh. If you’ve seen the movie, you’d recall that Ranbir Kapoor was particularly peeved with the Scooty gifted to him by his grandfather. Because by then Priyanka had fed us with the notion that like all things pink, the slim sedate variants of a scooter were feminine. Why should boys have all the fun? Last year, the auto sector was abuzz with the comeback of Bajaj Chetak which was set to be launched in the rural scooter segment. The company had ceased the scooter production in 2006, but with falling motorcycle sales, Bajaj had re-registered the ‘Chetak’ brand name. Nonetheless, I doubt if we ready to ride scooters again. The slow demise of a scooter is hardly a surprise. In fact, many would say, what’s the point of remembering it today? One of the signs of development is that we tune ourselves with the developed world where brands align with comfort. Today, a young man working in an MNC would rather be seen dead than riding a scooter. It would be another story, of course, if scooters are marketed on the lines of the coveted Harley - a toy that marks social arrival. Exclusivity. Then, perhaps we could see mushrooming of scooter clubs with scooter buddies whizzing on the Gurgaon-Faridabad road on weekends. Until then, the good old scooter has perhaps cashed its chips, called it quits and kicked the bucket for good. At least in Delhi/NCR. What a lovely post! On hindsight, I think the scooter gave the feel of liberation within the lines drawn as compared to the free spirit of a non conformist associated with the royal enfield. Chetaks are like their Stallions...what a lovely thing to say. I remember standing next to the basket too and later it was my brothers turn. It was almost a necessity in towns like Moradabad, Kanpur and Lucknow where dad was posted for good ten years. Thank you for a warm comment, made my day. Just the other day I was telling the husband, gone are the days when a Scooter or bike was the stepping stone to the four wheeled drive. Our aspirational generation looks down upon the humble two-wheeler. But given the alarming levels of pollution, it's time we make sure the scooter makes a comeback. Today in Gurgaon or Delhi, I'd feel a bit unsafe on a two wheeler. However, it's ideal for crowded markets and short distances when parking is a big hassle. Given the harsh weather and heavy traffic, I'd prefer a car too. But small towns and eighties had their own charm. 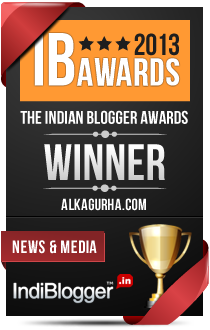 This post took me down the memory lane Alka Gurha. Scooter rides were fun then. Now with so much traffic around us I am too scared to ride one ! I think the kids of today gen are missing out on so much fun :-)May dad had a Bajaj Chetak too and we have such fond memories of it ! How awesome is that Amit! I had no idea that Bajaj Chetak is dead! I just thought people didn't buy them enough these days. How sad! They really were such a quaint contraption. And with the kind of safety hazard they used to be (imagine Papa, Mummy, Pappu and Munni on it) I guess they are a relic best left in our past socialist lifetime. I cant think of riding a two wheeler on the NH8 or on the Sohna Road with heavy Mixers and trucks threatening to crush me. Your post is really nostalgic...reminds me when my father used to drop me to school on his scooter in winters and how we braved the spine chilling cold waves. I was so upset to see a kabadi taking away our old mate of years!! HAMARA BAJAJ...!! So good to see you here Sonia. Thanks. The scooter brings back lots of memories much the same like you narrated in this lovely post! The most unforgettable moments were rides in the rain with my wife and small daughter when posted in Goa! Today, people hire a two wheeler to enjoy Goa rains. What lovely memories. You do? How awesome is that! I can relate to those memories; that image is a stamp of the times flown past. But, my friend, Vespa is back on the Indian roads! The only trouble is, they might burn a hole in the humbler pockets like mine. You brought back memories. Quite like you we, my sister and i, would travel to the bus stop with our father on his scooter. It was no mean task since we had these carefully pleated skirts ironed to razor sharp perfection and two of us had to squeeze in together . Yet we did it for years on end. And as a result I became a champion pillion rider coveted by all my friends when they were learning to ride doubles. Our father still has the scooter reserved for the smaller city streets. I have moved to an Activa which I find way more handy than a four wheeler. Its liberating, riding a two wheeler for short distances. Thanks Tulika. Chetak was a part of every middle class household. I have so many memories associated with it. And even with Fiat car. This post took me to good old days, when all I wanted was a scooter ride and orange ice lolly. 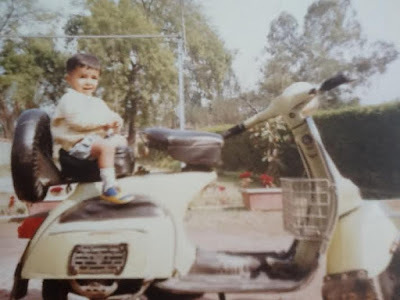 Your post reminded me of my Dad's Bajaj chetak...those were the days! I wouldn't mind driving it again - would be quite a spectacle for people! Wow, you have many more memories than I do. Apologies for a late response. Love the post. Saw a Vespa and once pillion with a friend who borrowed one. That was in 2004 at midnight when we went to buy fags and sat where the couch was gone. I remember kicking my Kinetic Honda Marvel in the morning winters..got fed up and revved it. Vespa is the identity of middle class Indian and defined the mass human horde. Your post reminds me how lucky I was. Still remember whole families going out in a scooter! *sigh* Too bad it's become passe! Now, everyone wants to be seen in their Mercedes Benz! Aspirations plus convenience plus style. oh yes reminds me passing out of school and going to college .. my dad bought me a VESPA scooter as according to parents a bike was dangerous ..
and it was a BIG think buying a scooter , even bought some sweets on way to give to neighbours ..
those were the good old days ..
Yep, those were the days. Traffic today is a nightmare. I've not seen much of Vespa but I remember our neighbour having a Scooter and how comfortable it would be for us kids to stand in front while being driven :-) My dad had a suzuki and I have loads of memories going to school in that, but yea these days you hardly find those vehicles. You have a lot of new models which dont stand the test of times! Nothing like our good old Vehicles with which we were emotionally attached to. True, but I don't think they are convenient in today's crazy traffic and chaotic weather. Only memories. ahh the memories of scooter... There have been days when our whole family of 5 would travel on scooter, to a distant relative's place. But that was decades ago. We still have our Hamara Bajaj but Dad now prefers scooty since it's lighter or the good old Maruti 800.